The sub-alpine larch is unusual in that it is a deciduous coniferous tree that loses its needles in the winter. Small tree, seldom symmetric, 10-15 (up to 25) m tall; bark thin but deeply furrowed and flaking, reddish-brown to purplish-brown scales; young twigs white or yellowish tomentose. Needles deciduous; pale blue-green (yellow in the autumn); rigid; in bundles of 30-40 per spur; 4-angled; 25-35 (40) mm long. Seed cones elongate, 35-45 mm long, 1.5-2 times longer than wide; pollen cones yellow, about 15 mm long. 1. 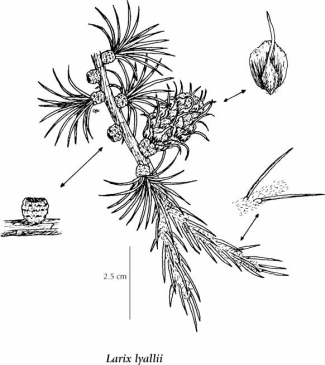 Seed cones usually over 2.5 cm long, bracts longer than scales; needles 3-4 cm long. Source: The Illustrated Flora of British Columbia. Mesic to dry rocky or gravelly slopes in the subalpine to alpine zones; frequent in SC and SE BC; E to SW AB, and S to WA, N ID and W MT.